Recently, while Churchill Downs was right to “lead” with the fact the purse for the 2019 Kentucky Derby Presented by Woodford Reserve (G1) was being raised from $2 million to $3 million, for horsepeople and industry insiders they buried the lead of the track’s overall purse structure for the 2019 spring meet waaay down in the press release. Raising the purse of the continent’s most famous race is news, along with the sizable increases for the other stakes races Derby/Oaks weekend and Stephen Foster Handicap (G2) night. It adds another level of prestige to already important events, and hopefully the money allows the Kentucky racing circuit to remain competitive for stakes-level horses with the significantly richer stakes purses offered in New York. However, only one horse can win the Derby, and winning on the first Saturday in May already carries a status level that goes well beyond the winner’s share of the purse. The additional million dollars is great—it helps keep pace with other top races such as the Pegasus World Cup Invitational Stakes (G1), Dubai World Cup Sponsored by Emirates Airline (G1), and Breeders’ Cup Classic (G1)—but what’s in it for everybody else? “More than $30 million in total prize money—$12 million in stakes races and another $18 million in overnight races—is expected to be offered during this year’s spring meet. The first condition book of scheduled races is being finalized by director of racing Ben Huffman and is expected to be published in early February. A quick calculation suggests that’s more than a 33% lift in stakes purses—more than $2 million when taking out the Derby’s increase—and a 34% rise in total purses for the spring meet. 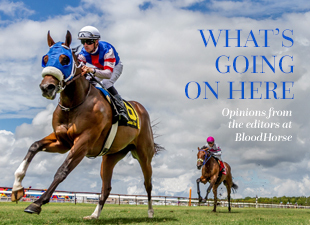 Sounds like great news to us, but not according to the readers of BloodHorse.com. More than 170 comments have been posted on the story with the majority of them being negative—I know, we find that shocking in this industry—berating the company for putting so much money into its signature event and not across the board. We’d never berate the readers of our website, but it appears most of them didn’t read past the explanation for the Derby’s increase. Also at the bottom, the release explained where the money is coming from: from revenue derived from the new historical racing parlor, Derby City Gaming, that occupies the Old Louisville Downs harness track. Should revenue continue to grow—and there seems little reason to believe it wouldn’t—we can expect further missives from Churchill Downs regarding raises in its overnight purses, not only for its iconic spring meeting, but for the September and fall meets later this year. Our guess is Darren Rogers, Churchill’s senior vice president of communications, will have the lead much higher up in the press release.